How deep is you pronoun usage knowledge? 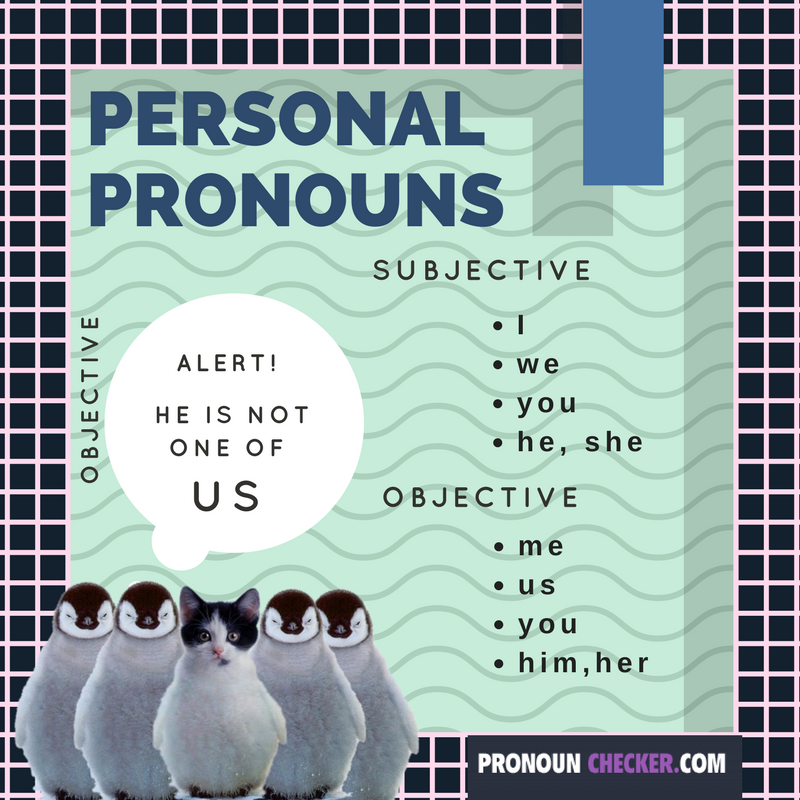 Do you know that pronouns are considered as part of speech but some of the theorists don’t consider them as a class due to the specific feature – they perform a variety of roles in the modern language. Pronouns (antōnymía) are listed as one of eight parts of speech in The Art of Grammar, a treatise on Greek grammar attributed to Dionysius Thrax and dating from the 2nd century BC. The pronoun is described there as “a part of speech substitutable for a noun and marked for a person.” Pronouns continued to be regarded as a part of speech in Latin grammar (the Latin term being pronomen, from which the English name – through Middle French– ultimately derives), and thus in the European tradition generally. Pronouns in sentences play a very prominent role, often pronouns come as the main members of the sentence and act like subjects. That is exactly why it is so important to use pronouns correctly, in order to clarify for your reader what noun they refer to. If to generalize all the pronoun-related rules you can see that all that you mainly need to remember is that the pronoun in the English should be adjustable with the noun in number and subject, as well as clearly indicate what noun it actually refers to. Let’s sort out the most popular questions about pronoun usage that bother people all around the world. After that, you will be able to identify the major problems related to pronoun usage or check them with pronoun checker just to be sure. Q: What is possessive pronoun? How to use it properly? What’s yours is mine my friend. Q: Which pronoun is used for animals? Personal: My dog, whom I call Jake, is my best friend. Generic: The stray dog on the streets was barking and chasing the cats. 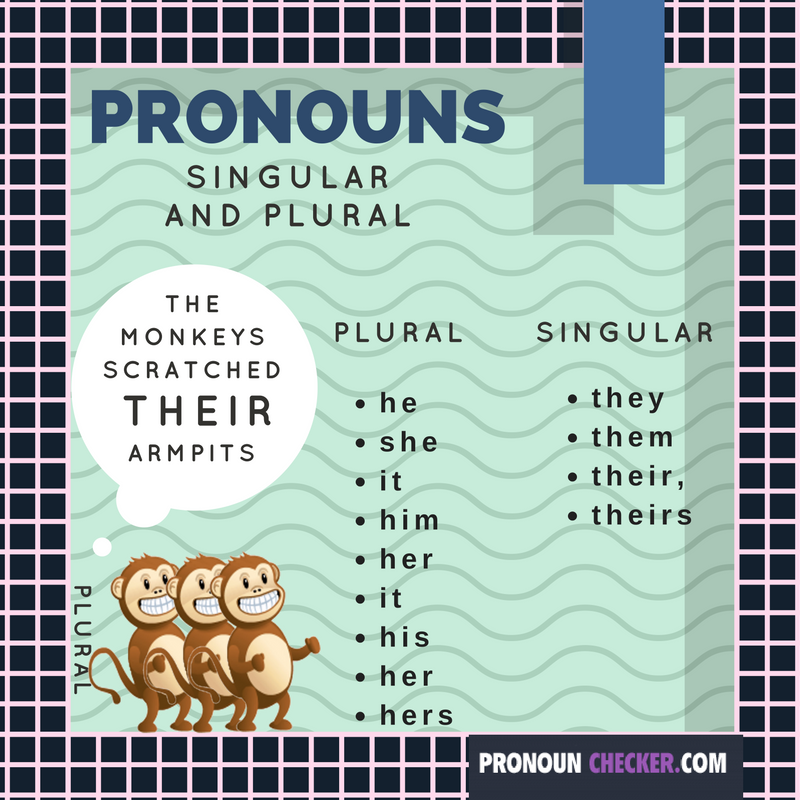 Q: What relative pronoun singular or plural should I use? The wrong sentence – Lindsay tried to find the ski poles, but it was too big. You can’t use the sentence construction because the ski poles are plural that doesn’t match with it. The right variant will sound like – Lindsay tried to find the ski poles, but they were too big. Q: Which pronoun to use for a company? A: When you’re writing about the company it is a common dilemma what’s better to pick “company who” or “company that”. Companies can make certain actions, just like people do but it doesn’t mean we can apply the same pronoun to them. The legal entities include people working in them but remember that companies don’t function by themselves, meaning you can’t refer to institutions using the same pronouns you apply to people. Like for other inanimate subject apply “it”. Incorrect: the company will issue their month report tomorrow. Correct: the company will issue its month report tomorrow. 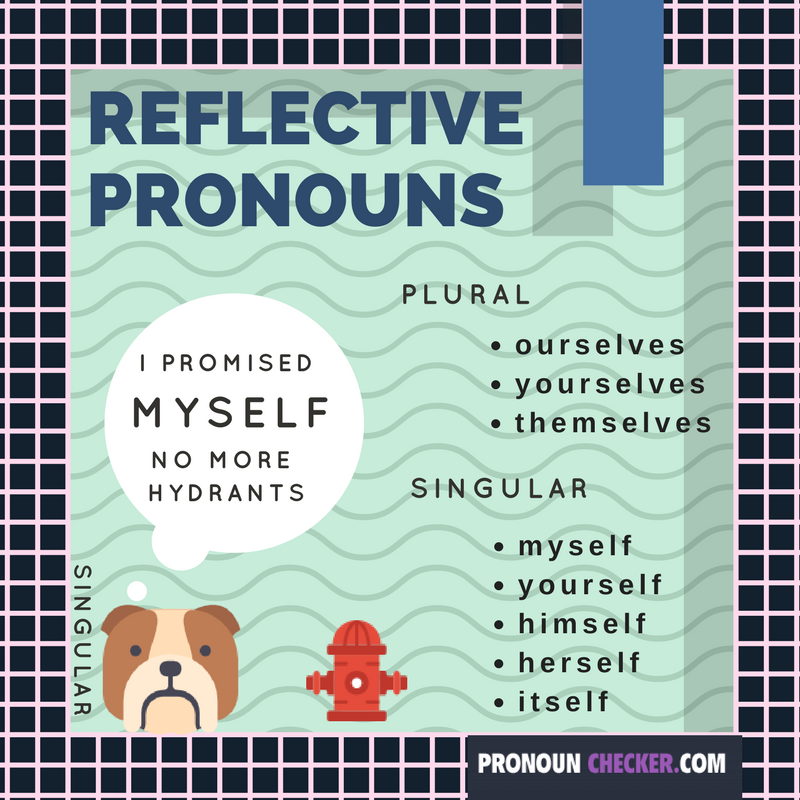 Q: What is reflexive pronoun? A: A reflexive pronoun shows that a particular person who is realizing the action of the verb is also action’s receiver. The reflective pronouns in the examples below depict the thing. I was hungry, so I ate the cookie myself. You’re going to help yourself today. We wanted to impress you, so we baked a cake ourselves. Q: Which pronoun is used for country? A: In case you don’t want to sound particularly old-fashioned use “it” when referring to the country. There were cases mostly in informal talks and public speeches including such pronoun usage long ago but in the modern language it is considered wrong. Correct: America and its allies. Q: What is object pronoun? A: The object pronoun is used as a direct or indirect object of the preposition or the verb. Just in the same way as subject pronouns, object pronouns turn singular or plural, masculine or feminine. In case you refer to the inanimate object like weather or time, animal or city just use “it”. Please tell them to come over later. Q: What are pronoun adjectives? Q: Which pronoun or adjective to use? What’s the difference? A: Pronoun is a word that substitutes the noun it, he, she, they, them, us, etc. Who, whom, what belong to interrogative pronouns, when it’s clear what you’re talking about and there’s no need to mention the noun again. The adjectives described the noun depicting its particular features like color, size, weight, etc. Q: What is subjective pronoun? He spends too much time playing videogames. After lunch, she goes out. Q: What is personal pronoun? A: The personal pronoun is associated with a certain person in the sentence. Personal pronouns can be singular or plural and of different genders, they also take different forms. 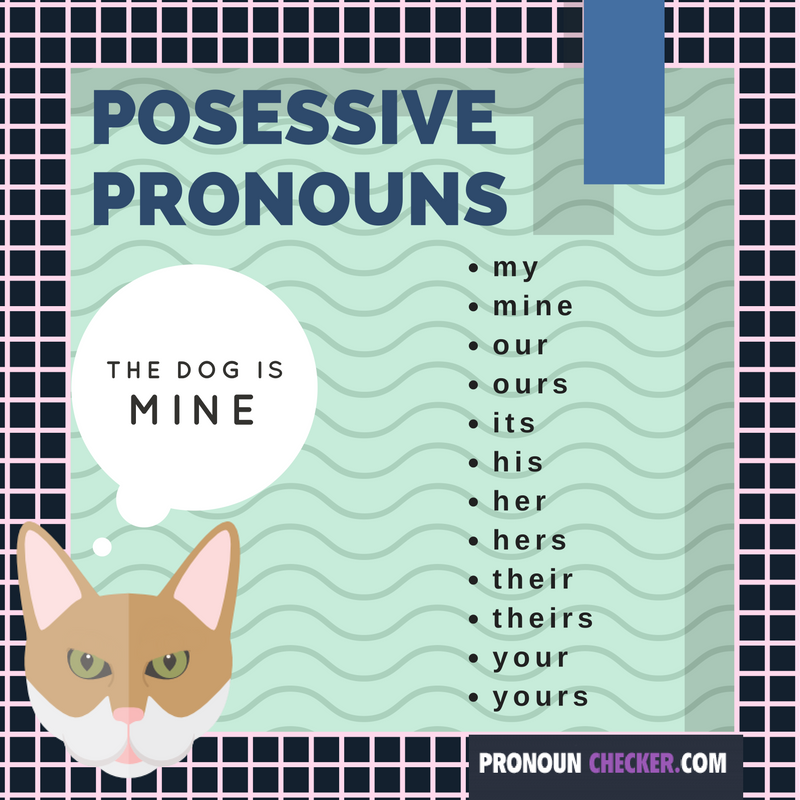 Personal pronouns used for people, animals and objects as well. We should invite him to the party. Q: What is indefinite pronoun? A: Unlike subjective pronouns, the indefinite ones do not refer to the person, object or subject, those are words like “anything”, “something”, “anyone”, “everyone”. Indefinite pronouns can exist in the singular and plural form, usually a singular pronoun takes a singular verb and vice versa. Pronoun usage rules are not that hard to master, after all, if you are replacing a plural noun the pronoun should be plural as well. Words like “everybody”, “anybody”, “anyon”e, “each”, “neither”, “nobody”, “someone”, are singular that’s why the referring pronouns should be singular as well. Polish your practice with writing, reading and пщштп еркщгпр specialized games and quizzes and your grammar skills will get superior soon. Don’t want to wait? You can have it all right now! Using pronouns correctly is easier now!